Lyndsay Phillips is a serial entrepreneur; self-professed organizational freak, client-appointed task master plus project ninja and warrior VA for life & business coaches, accountants and other online entrepreneurs across the globe. CEO & Founder of Smooth Sailing Online Support, she leads a rock star team to support entrepreneurs who are seeking fast-paced business growth but finally have come to the realization that they can’t do it alone, do it all, and do it well. She is also the host of Sailing To Success Podcast and Smooth Sailing Online Support TV – and loves sharing practical tips and business-building strategies so that you can be more productive, boost your profits and grow your business. 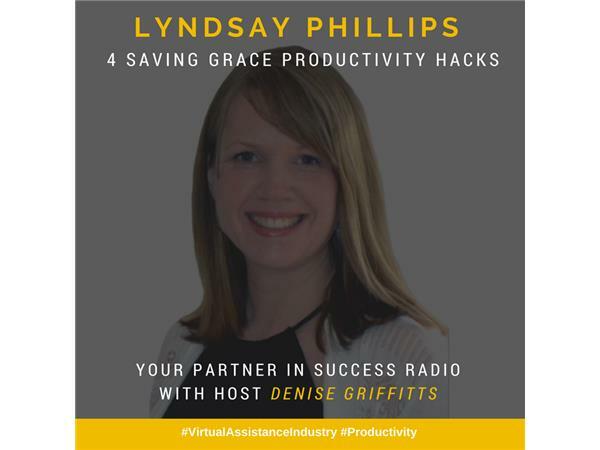 I was recently a guest on Sailing to Success Podcast and you can hear my interview 'Productivity in Technology' with Lyndsay here. How does project managmeent save time and make your virtual assistance team more productive? Email and calendar management tools and tips to help with inbox overload. How to get your client work done and still find time for personal and business growth.